A hot spot is a very painful and sudden localized skin infection that needs immediate care. In this article you will learn exactly what you need to do to treat hot spots at home. 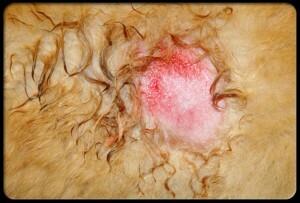 You will learn exactly what a dog hot spot is, and the causes of these localized skin infections. Then you will find the exact steps to take to treating these at home, and preventing hot spots in dogs from reoccurring. 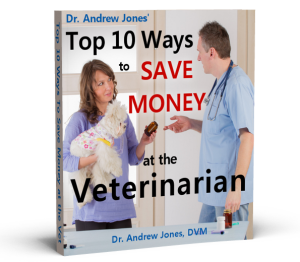 The veterinary name for dog hot spot is called acute moist dermatitis. This is a surface skin infection that is very itchy, smelly, and often appears wet or moist. They are a local area of bacterial infected hair follicles. Dog hot spots often form on the face and at the base of the ears. Hot spots form most often during the warm summer months, but can happen at any time. Often they will start with a scratch or wound and then this causes the skin to become infected and develop into a hot spot. Allergic dogs will often scratch at their skin, allowing the bacteria to flourish locally and turn into an infection. Removing the hair around the hot spot is the first thing you want to do. You can use a pair of blunt nosed scissors to trim as much hair as possible on and around the spot. If you have clippers use them for trimming. These can be very painful and some dogs will not let you trim much hair. The next step is to clean the area well with some type of local antiseptic. One option is to use a mild, non-perfumed antiseptic soap such as chlorhexidine to clean the skin. Gently dab it on the spot, lather up and rinse well. Another option is to use antibacterial soaps, and then clean the area well after with a clean damp cloth. The key to curing hot spots is to get them to dry out. A very effective antiseptic drying solution is tea and aspirin. Brew up a strong cup of black tea and dissolve an aspirin tablet in it. Soak a cloth in this brew and apply it to the area for 5 minutes four times daily. Two soothing herbs that I frequently use for any type of skin irritation are Calendula and Aloe Vera. If you have one of these on hand, then use them after applying the treatment for drying out the hot spot (the tea and aspirin). Lastly the big key to preventing dog hot spots from recurring is by lowering the chance of your dog having an allergic reaction, and then subsequently scratching himself, triggering the problem again. This is best accomplished with adequate doses of omega 3 fatty acids, which can best be given in the form of flax oil. I advise a dose of 1000mg per 10lbs daily, which equates to 1 tablespoon per 50lbs of body weight daily. Hot spots in dogs are serious localized skin infections that can be both treated, and prevented at home. They are usually caused by an allergic dog which scratches himself, allowing the normal skin bacteria to flourish, and form a wet, painful, red area of skin. Treatment involves removing the hair, applying topical remedies to decrease the inflammation, treat the infection and dry up the wound. Prevention is geared toward stopping the allergic response, and best accomplished with the proper dosage of essential fatty acids. MY DOG REX HAS HAD THIS PROBLEM ALL HIS LIFE. HE IS A GOLDEN RETRIEVER, GERMAN SHEPHERD, CHOW MIX WITH A HEAVY DOUBLE COAT. IN THE SPRING AND FALL IN PARTICULAR, HE WAS VERY VULNERABLE TO HOT SPOTS. I STARTED USING TEA TREE OIL IN A SPRAY BOTTLE. I SPRAY IT ON THE TROUBLED AREA, AFTER I CLEAN IT & TRIM THE EXTRA HAIR, AS DR. JONES HAS SAID. THIS WAY I DON’T HAVE TO TOUCH THE AREA, IN CASE IT IS PAINFUL, AND IT COVERS THE AREA COMPLETELY. EVEN THOUGH MY DOG HATED THE STRONG SMELL, WHENEVER I GOT THE SPRAY BOTTLE OUT HE WOULD COME OVER & LET ME SPRAY THE AREA, BECAUSE IT ALMOST INSTANTLY HELPED THE ITCHING AND MADE HIM FEEL BETTER. IT ALSO DRIES OUT THE AREA. ALSO, THE TASTE IS SO AWFUL, IT KEEPS HIM FROM LICKING THE AREA AGAIN, UNTIL THE SPRAY WEARS OFF.